A Dark Cult is Reborn! It has not been long since the evil cult swept across the civilised world. Appealing to the broken, the poor and the outcast, the influence of the Forgotten spread like an unholy crusade. Although the movement was eventually exterminated, hints of its corrupting power are returning once again. Can you eliminate the threat before it gains a foothold, or will you fall to the Crusade of the Forgotten? 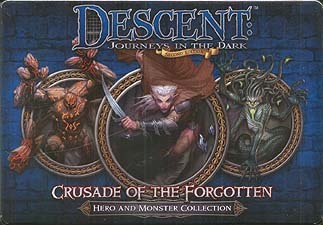 Bring legendary heroes and infamous monsters to your Descent: Journeys in the Dark Second Edition game with the Crusade of the Forgotten hero and monster collection. Explore the unique strengths and abilities of these monsters and heroes by playing the included quests individually or through the use of rumour cards. With 4 heroes, 3 monster groups and 2 new quests, the Crusade of the Forgotten hero and monster collection gives fresh options to your Descent: Journeys in the Dark game!